This home is part of a property in the hills of Castiglione Fiorentino. The cottage is built in the last century, renovated respecting the original style and perfect for a number of families together who have a nice pool to share with the other guests. Even though il Podere consists of different houses you have enough privacy for your family but also the opportunity to enjoy the other facilities together with the other guests. As a guest, you have a large, relaxing garden and a swimming pool (12x6m). Under the pergola in the garden you can enjoy your meals. This is a nice holiday address for a relaxing holiday in an interesting environment with the historic cities within easy reach. Castiglione Fiorentino is located just 1.5 km, Cortona is only 12 km. Around the house rows of olive trees and oak trees, the swimming pool with views of Castiglione Fiorentino, surrounded by lavender and rosemary bushes. What else do you want! In nearby Castiglione Fiorentino you will find all the services you need, and the train station is just 10 minutes away, providing easy access to many places without having to take the car. The nearby town of Castiglione Fiorentino is full of typical restaurants offering local cuisine, Pizzerias, Bars, Pubs and shops. Casa Poggiolo is strategically located for easy access to Rome, Florence, Siena and Montepulciano, Chianti and Val D'Orcia with suggestive towns of Pienza and Montalcino. 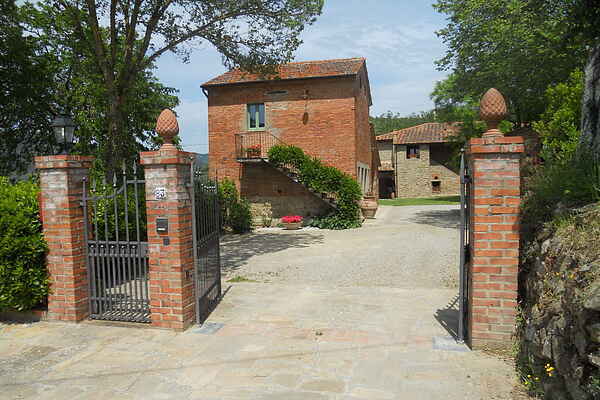 The property is 10 minutes from the railway station of Castiglion Fiorentino, on the Rome-Florence. Pool towels are included!